What kind of adventures do you plan on getting into with your new truck? The answer to that question probably depends on just how capable of a vehicle it is. Does it have the power you need? The handling and the safety? The 2017 Toyota Tacoma offers Avon, Indianapolis, and Plainfield drivers a little bit of everything. And you can get to know it a little bit better just by reading this review by the Andy Mohr Toyota team. There isn’t another class of vehicle on the market today with the sheer towing capabilities of a truck. And the 2017 Toyota Tacoma aims to offer a pretty decent capacity for local drivers. When equipped with the standard array, the Toyota Tacoma is able to haul up to 3,500 pounds of additional cargo. However, drivers can expand this capacity to 6,400 pounds when they add in the V6 Tow Package. What will you find in this package? All the equipment necessary to help you haul safer. First and foremost, you’ll have features such as the Class-IV hitch receiver, and the 4- and 7-pin connector with wiring. However, trailer sway control is also included. Towing equipment plays a key role in Toyota Tacoma hauling. However, the powertrain is also a huge help. In the 2017 Toyota Tacoma, drivers will have a few different engine options to choose from. However, this truck comes standard with the 3.5L V6. 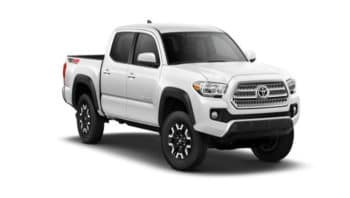 The Tacoma standard powertrain comes with a couple different enhancements to help boost power flow, including variable valve timing with intelligent exhaust. With these, the engine can produce as much as 278 HP and 264 lb-ft of torque. The Toyota Tacoma also benefits from standard 4WDemand part-time 4-wheel drive (4WD). This drivetrain includes an electronic transfer case and automatic limited slip differential. With these features on your side, staying on course should be no problem at all. 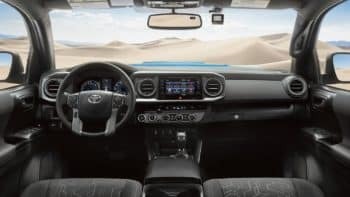 Review the 2018 Toyota Tacoma now! The 4WD system in the 2017 Toyota Tacoma can be a huge help in keeping drivers safe out there on the riskier roads. However, a few other safety technologies are necessary for enduring passenger protection. That’s why the 2017 Tacoma also comes with the Star Safety System™. Star Safety™ features numerous different safety technologies, all of which can help heighten and sharpen your truck’s performance. Stability and traction controls work hand in hand with your 4WD to ensure your car can handle even slippery or loose roads. However, you’ll also have smart stop braking technology to ensure that you come to a complete stop. Do you think the 2017 Toyota Tacoma may be right for your Avon, Indianapolis, or Plainfield lifestyle? You won’t know for certain until you’ve taken it for a spin. You can do so just by getting in touch with the Andy Mohr Toyota team. Contact us today to schedule your 2017 Toyota Tacoma test drive!